Were they lucky or good? Obviously, if they were very lucky, then success next year is less likely. Heading into this season, I was one of the few Eagles writers/bloggers to predict anything resembling what actually happened (I had them at 9-7, but I was just 20 points off on the point differential). Part of the reason I was so bullish was that the Eagles had bad luck last year, especially as it relates to turnovers. It’s possible that Nick Foles’ “elite” quality is the ability to avoid interceptions without abandoning downfield throws. It’s possible he just has an excellent internal sense for the risk/reward of each throw. Or, if you think back to my blitz post (windows v. time), he might just have a very good sense of when a window is large enough for his skill level. If that’s true, than I don’t see any reason why he can’t be an “elite” QB. Of course, we don’t know if that’s true and, on balance, it seems unlikely. Today, let’s take a very preliminary step towards testing it. As the title suggests, I think the best way to proceed is to see if Interception Rate persists over time. In other words, how much does a QBs interception rate one season tell us about his rate the following season. If it does persist, then avoiding interceptions is likely a skill and we can feel really good about Nick Foles. If it does NOT, then we’re in trouble, because Foles’ amazing statistics this year were built primarily upon not throwing interceptions. 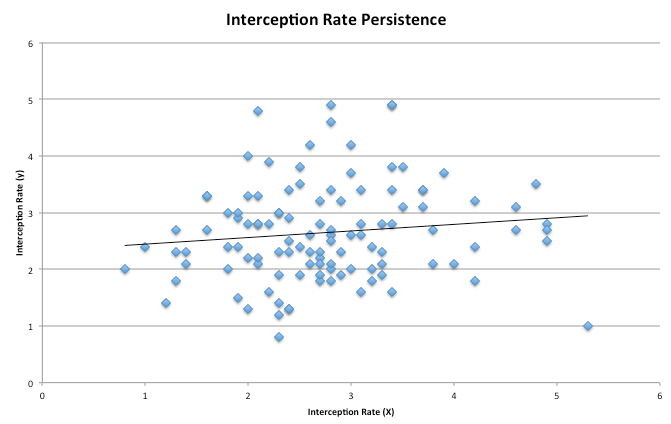 There are a number of issues with trying to test interception rate persistence, so before we even get close to a result, we need to remember everything here is just informative rather than solid proof (I’ll explain the problems below). Peyton Manning, Eli Manning, Drew Brees, Matt Stafford, Philip Rivers, Tom Brady, Carson Palmer, Ben Roethlisberger, Tony Romo, Matt Schaub, Michael Vick, Matt Hasselbeck. Then, I removed any season in which the player did not have at least 100 pass attempts. 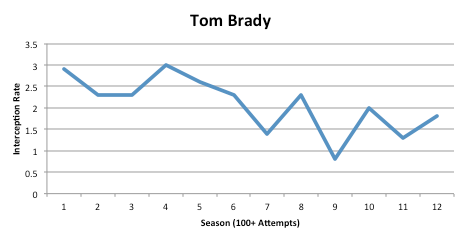 For example, Tom Brady had an interception rate of 0 in 2008….because he only threw 11 passes before getting injured. From there, I matched each player’s season interception rate with their rate the following season, ending up with 111 matched pairs. Hmm….not what Eagles fans wanted to see. The correlation value is 0.12, so real but relatively weak. In other words, a good interception rate one season was not very likely to result in a good interception rate the following season. OR, interception rate is composed of some skill plus a fair amount of luck (that sounds about right). I mentioned one issue with this analysis above (sample bias), but I want to mention another big one here. We haven’t accounted for defensive strength. It’s possible (likely in fact), that good defenses intercept passes at a higher rate than bad defenses. Some of the variation in QB Interception rate is therefore explained by differences in the year-to-year schedule (which are largely random). As I said, informative not dispositive. After collecting the data I looked at it from a few other angles, which led to a few interesting takeaways. In fact, 4 of the 13 QBs recorded their highest seasonal interception rate in their rookie years. Moreover, another 4 of them had rookie interception rates than ranked as their second worst season. So together, 8 of the 13 QBs had either their worst or second worst interception rate their rookie seasons. That doesn’t really TELL us anything, but it certainly suggests that QBs may improve their ability to avoid interceptions over time (which matches the “conventional wisdom”). That, of course, would be great for Nick Foles, whose rookie rate was just 1.9%. He really does ruin everything…. 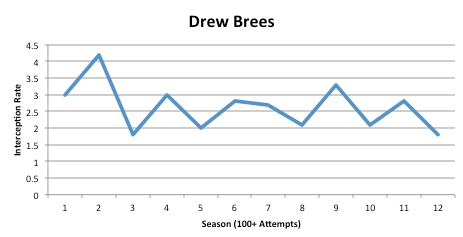 (and he throws a LOT of interceptions; compare his X-Axis to the others). – The key to remember, though, is that Nick Foles registered an interception rate of 1.9% in his rookie year and just 0.6% this year. His career rate is now 1.2%. That means, even if he is due for some regression, he’s got a lot of room to work with. He could triple his career rate next season and still be at just 3.8%. That’s high, but every QB in the sample except Rivers, Brady, and Rodgers, have hit that level at least once in their careers. Additionally, if Nick Foles can IMPROVE his rate over time, as the QBs I showed above did, then he really will have an identifiable “elite” skill. That’s probably unrealistic (you just can’t get much better), but remember that an improvement in skill would counteract the regular variance he’d expect to see. Nick Foles is very likely to throw interceptions at a higher rate next season than he did this year. However, I wouldn’t bank on a massive shift, and given where his career rate is, I STILL expect him to finish the year with a very good interception rate (< 2.5%). That’s good news for Eagles fans. Let’s not forget that, for all his other faults, McNabb maintained a historically low interception rate while consistently going downfield and he did it with significantly worse WRs than Foles will likely play with during his career. So it’s entirely possible that this is a repeatable skill. Even if his interception rate is more human next season that’s hardly a “red flag”, in my opinion. Calling it a red flag implies that we needed that insane percentage to win the games that we did. In games that Foles started in we went into the fourth quarter with a two score or more lead in 5 of 10 games (5 of 11 including the playoffs). In games that Foles played more than a half we won 6 of 11 games by two scores or more (6 of 12 including playoffs). The reason that is significant is because a lot of our wins with Foles at the helm were not close contests. It even became one of the arguments for people that we hadn’t seen him perform in high pressure situations because of the dominant performances we were stringing together. My point is that there was room for error but Foles continued to play clean games instead of making things closer than they needed to be. Granted a turnover here or there may have turned the outcome in some of those games but we were a convincing 8-2 with Foles as the starter. If the defense improves in it’s second year in the 3-4 (which we’re all hoping but can’t know) then the need for Foles to be flawless is even less of a factor. If we’re searching for something that we don’t know if we can count on for next season I would look more in the direction of how amazingly healthy we were all year. People cite the training and health programs but bones and ligaments don’t stay intact during a strange impact simply because someone drank their smoothies regularly. I’m intrigued by your “elite” trait narrative. First, I don’t think it comes down to one thing alone with Foles. He excelled at beating the blitz, not turning the ball over, his red zone offense was outstanding, and he completed passes beyond 10 yards at a better clip than the likes of Tom Brady. The main thing I want to emphasize is that red zone efficiency. He attempted 37 passes from the OPP 19-GL (the split stat ESPN.com uses) and of those 37 attempts 16 were touchdown passes. On top of that he completed 70.3%, didn’t turn the ball over a single time (fumbles included), rushed for 3 touchdowns, and achieved a QB rating of 122.4. 43% of the passes that he attempted in the OPP 19-GL range went for touchdowns. 38% of the time that he dropped back to pass from inside the OPP 19-GL he threw a touchdown pass (including the 5 sacks he took). In my mind that is his biggest strength. After years of red zone struggles Nick Foles is nothing short of a revelation. I’m curious to hear why you don’t think he can become “great” and is simply “good enough”. I’m a huge Foles supporter but I like hearing why people have reservations. His skill set is much more similar to the elite QB’s in the league than say Cutler or Kaepernick. I would venture to say that none of the elite QB’s (Manning, Brady, Brees, and Rodgers) have any elite physical attributes. The closest thing to it is Rodgers with his arm but even that is probably top 5 at best. Brees and Rodgers both have more mobility than Foles but Brady and Peyton make Nick look like a respectable athlete. Too much credit is given to cannon arms and “potential” in general. A lot of these physical freaks develop really bad habits. Like the mobile QB’s that have no pocket presence and escape the pocket at the smallest sign of a pressure or the Cutlers of the world that over confidently throw balls into tough spots only to see it get intercepted. There are many reasons that Brady has been so successful and not all of them are due to his own abilities. Being fortunate enough to have a head coach that’s an absolute genius has definitely helped (yay parallels!). I also believe that Tom is a very overrated quarterback; however, I struggle to come up with a definition of ‘great’ that doesn’t include him. The key takeaway for me is that I’ve never seen Tom Brady do something and thought ‘Wow, there’s no way Nick Foles could do that’ in the same way that you might with the likes of Stafford or Vick. While I’m not saying that Foles is ‘the next Tom Brady’, I think he’s got the playing style and work ethic that could see him develop into a very similar player. I do think Brady is a great comp, its just hard to talk about that without sounding ridiculous. Also, there’s a reason there is only 1 Tom Brady. It seems rare for a QB to be very successful without an identifiable great trait. You’re right though that Brady doesn’t have any measurable tools the jumped out as elite. I think work ethic is an important point, because it’s another area fans don’t see but one that can make a huge difference. Last season, Foles was terrible on deep balls. He couldn’t keep them in-bounds let alone complete them. It looks like he successfully worked on that over the offseason though and came back much improved (though he still has a ways to go there). When I say “good enough”, I really just mean that he can DEFINITELY by Joe Flacco or Eli Manning-level. That’s all you need to win. In theory, he could be the next Tom Brady. However, I think’s its much more important/interesting to know where Foles’ floor is rather than his ceiling. Agreed on all counts – the Brady comparison is always going to sound ridiculous unless and until Foles manages to keep this performance up for several seasons. I have some comments and some nerdy quibbles. First, something that is not being controlled for in any of the analysis (particularly the graphs) is the quality of the targets the QB has at his disposal in a given year. This leaps out when looking at Tom Brady and Eli Manning. When Tom Brady had a motivated Randy Moss, his interception rate fell to 1% or less. When he had Moe, Larry, and Curly, it was higher. 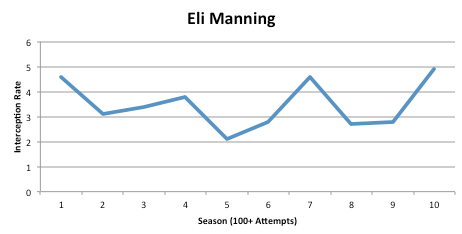 DItto (and then some) for Eli Manning, though Eli is always a bit of a gunslinger. getting good, consistent separation. Riley Cooper was extremely variable and disappeared for games at a time. DeSean Jackson’s small size sometimes makes it extra hard for him to separate if he was being covered by a speedy tall corner who was also getting consistent safety help. Foles’ biggest flaw was his tendency to hold the ball too long and/or not know how, when, and where to get rid of it once a play was clearly not there. This was most apparent in the final two games of the season, particularly the several sacks and “intentional grounding” calls he drew. As he learns when to simply toss the ball to the sidelines and get on to the next play, I think he will improve significantly. Furthermore, in Kelly’s offense this has the compounding effect of stressing and tiring out the defense. 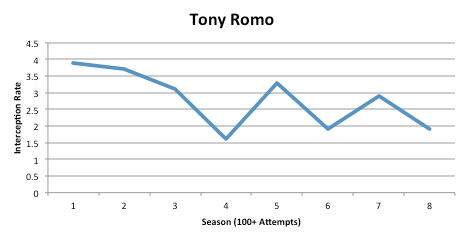 1) Measuring the presence (or absence) of serial correlation in a QB’s series. I’m sure it would be significant, but I’d want to see the level and average level. Is it 80%? 50%? 20%? 2) Measure the standard deviation of the interception ratio, possibly leaving out the rookie year. See what kind of a range two standard deviations from the mean represents. 3). Using some index to assess the top two receivers available to the QB in each game and correcting for that, then possibly analyzing the std deviation of the residual. where a previously-competent vet just starts throwing picks like crazy. I’d be interested to see if there’s any warning sign in the data leading up to that. Fair point about quality of WRs, but it’s one that I just don’t know a good way of controlling for. AdvancedNFLStats has an added point system that might work, but I don’t think there is historical data to work from. Conceptually, I think Foles’ “weapons” are likely to improve, which as you suggested would likely result in a lower INT rate. That may counteract some of the negative variance in his rate. It wouldn’t surprise me at all if the Eagles selected a WR in the first round this year. Part of the reason he took so many sacks (IMO) was that his WRs were NOT particularly good at creating separation. Obviously, changing that would turn some of those sacks into additional completions. 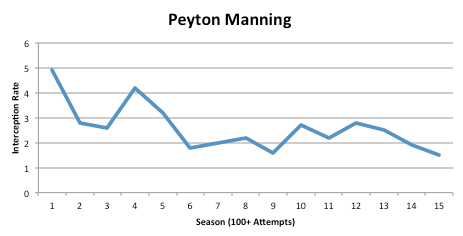 I looked at the standard deviation for each QB, but didn’t end up including it in the post. It’s all over the place depending on which QB you’re looking at. Rodgers has an incredibly low STD, while Eli Manning’s is high. I may try to identify a sample of QBs who’s skill-set matches Foles and see where that leads me. 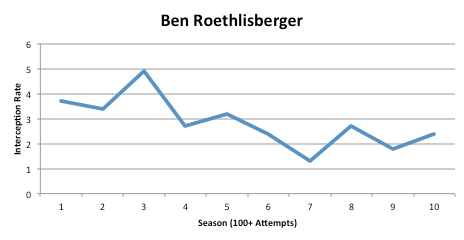 I didn’t include his chart, but Matt Schaub showed the late career effect you mentioned. You could say Eli Manning this year did as well. However, I haven’t explored that enough to know if there are any warning signs. There are also “at fault” and “no-fault” interceptions from a QB’s perspective. If a receiver bats a ball in the air and it’s intercepted, that’s not really the QB’s fault. Ditto if a receiver blows a route on a timing play, the ball has left the QB’s hands long before there’s anything he can do about it. Batted ball interceptions are the type of luck (or lack thereof) that tends to mean-revert. Vick had quite a few batted-ball interceptions in 2012, and Foles had none this year that I could recall. Conversely, quality WR’s prevent interceptions on poorly thrown balls even if they can’t make the catch. DeSean Jackson is one of the best in the league at this. Sometimes it’s borderline (and not-so-borderline) offensive pass interference. So, a perfect interception index would remove both “no-fault” interceptions and make some sort of correction for “saved” interceptions as well. On the flip side, bold QB’s throw the ball into coverage and dare their WR’s to make plays. This is not a bad core NFL strategy. First, the WR has the upper hand over coverage both because they know where the ball is supposed to be and because of the DPI rules. Playmakers are in the league to make plays and a QB should trust their playmakers enough to put them in the position to do so. This has been the cornerstone of Eli Manning’s NFL career. At first I thought Eli was too reckless, but two Superbowl rings later I get what he’s doing and I admire him for it. The “helmet catch” only happens if the QB dares to throw that ball. Of course, if his receiver team is not up to the challenge he’s going to look horrible (e.g. 2013 Eli Manning). I’d contend that Eli is Eli and that his numbers fluctuate based on the talent he’s surrounded with and to a certain degree, luck. I’d rather have Eli Manning than Matt Schawb any day of the week if I had decent WR’s. Eli will have some horrible games but Schawb will never win a Superbowl unless he’s blessed with an absolutely dominant defense leading the way. Definitely. I’m keeping an eye out for Football Outsiders’ Adjusted Interception Rate, which accounts for dropped interceptions and tipped balls. Last year, for example, Foles was pretty lucky (according to FO’s charters). This year, though, I don’t recall many dropped INTs. Unfortunately, FOs adjusted INT rate data doesn’t go back farther than 2010, so we can’t do the same type of analysis. It would certainly make sense, though, if the Adjusted rate persisted at a much higher level than the normal rate. So although it makes “sense” that a lower interception rate would lead to victories, and it did this year, given the data you’ve accumulated on the other quarterbacks, how did their interception correlate to win loss ratio, or winning percentage? Before we care about interception rate, how does that correlate to win/loss.